79% of women strive to look their best every single day, and having the right beauty products can make or break a woman's beauty routine. 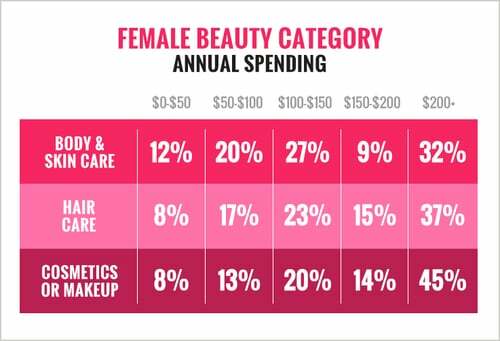 We wanted to get a better sense of how much they spend annually in each beauty category, so as part of the POPSUGAR Insights Q2 2014 beauty study, we asked women to tell us approximately how much they typically spend per category per year. Perhaps not surprisingly, women spend the most annually on cosmetics products. Overall, 59% of women spend over $150 per year on cosmetics, and 45% of women spend over $200 each year. Only 21% of women spend less than $100 per year on makeup and other cosmetics products. Fifty-two percent of women spend over $150 per year on body and skin care products. Overall, 37% of women spend over $200 per year on body and skin products, and 38% spend between $100 and $200 annually. Only 41% of women spend in excess of $150 per year on hair care products. Overall, 32% of women spend over $200 per year, but 59% of women spend less than $150 on products within the category each year. Hair care also had the highest percentage of women who spend less than $50 each year (12%) relative to the other categories we measured.